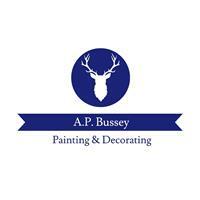 A P Bussey Painting and Decorating - Painter/Decorator based in Lowestoft, Suffolk. Professional, attentive and quality decoration. I use a dustless sanding system to ensure that all work carried out is clean and tidy as well as having the best finish possible. I have competed in competitions and worked across the country in all areas of domestic and commercial painting and decorating. Experience from new build work to restoration on listed buildings, quality and professionalism is guaranteed always at a fair price. All aspects of painting and decorating undertaken. Interior and exterior. new work, restoration, redecoration and wallpapering. No job too big or small. I have worked for 2 large companies in my time decorating and have gained experience from all aspects of decorating before now deciding to use my skills and start up on my own business and build a client-base for myself. Lime washing churches and lime rendered houses, sash window and rot repair, glazing, wallpapering and plaster boarding are some of the specialist skills in the trade I have become fully competent in. I will always go the extra mile to ensure customer satisfaction.